Last year, City Council Speaker Melissa Mark-Viverito’s office began seeking state approval for a public bail fund to keep poor low-level offenders out of jail, with Mark-Viverito citing the costs even a short jail stay can have on both lives and city funds. Now, after almost a year-and-a-half, the convoluted process of establishing the bail fund as a charity and obtaining a state license to run it appears to be nearing an end. Mark-Viverito touted the program in her first State of the City address as Speaker, in February 2015. "[I]f you can't afford bail you will spend on average 15 days in jail," said Mark-Viverito in her speech, given Feb. 11 from a public housing facility in East Harlem. "The results are predictable: people lose their jobs, or their housing, and cannot take care of their children while they are in custody. These are people who are accused of minor offenses and are still considered innocent in the eyes of the law. This is not justice." The city’s recently-passed fiscal year 2017 budget includes $1.4 million for The Liberty Fund, to cover operation and administration. The same amount was included in the previous year’s budget, but not used. For many criminal justice advocates, Mark-Viverito, and her team, the bail fund is a key program in a larger push for criminal justice reform. It goes hand-in-hand, they say, with a variety of other efforts spurred by either the Council or the de Blasio administration: a commission chaired by former Chief Judge Jonathan Lippman that is looking at closing Rikers Island; reforms to the city’s summons system and reduced penalties for low-level nonviolent offenses (see the Council’s Criminal Justice Reform Act); increased diversionary sentencing; and reductions in the number of arrests for possession of small amounts of marijuana. “From passing expansive summons reform to creating a citywide bail fund to instituting a Commission to tackle injustice on Rikers Island, the New York City Council is committed to commonsense reforms that will bring more justice and proportionality to our criminal justice system,” Mark-Viverito said in a statement to Gotham Gazette. “Across the nation, cities and states are engaged in a much-needed conversation about how we approach criminal justice as a country. New York City is at the forefront of these debates, and we are unafraid to lead,” she said. Some criminal justice reformers view bail funds as “band-aids” that don’t actually address what they see as the core problem: charging too many people with jailable offenses. They worry bail funds could actually prevent action on larger reforms. The city bail fund would establish a set of criteria for whom bail would be covered. State law that allows bail funds - there are already other funds operable but none at the scale of the City Council’s - restricts such funds to paying in misdemeanor cases where bail is less than $2,000. Members of Mark-Viverito’s staff say they expect the Council-aligned fund will be able to cover bail for 1,000 individuals each year and hope to reach as high as 2,000 annually. State law allows judges to set bail as an incentive for individuals charged with a crime to return for their court dates. But many poor individuals can’t pay and are forced to sit in jail waiting for trial - an outcome that forces the city to spend money for intake costs like transportation, beds, medical exams, and meals. According to a 2011 report from the Independent Budget Office, almost 40 percent of the city's then-12,000-member jail population was pretrial detainees who couldn't afford bail. The IBO estimated the cost of holding those alleged offenders at $125 million. The city’s jail population has continued a decades-long decline and is around 10,000 now, with about three-quarters of those detainees at Riker’s Island jail complex. The city has two other bail funds at the moment: The Bronx Freedom Fund and The Brooklyn Community Bail Fund. The organizations see over 95 percent of the people they serve return for all their court dates, a number far higher than for people who actually pay bail on their own. As far as the impact the city’s other criminal justice reforms are having, Ritchin and other bail fund representatives say they have not witnessed a major reduction in clients having been arrested for minor offenses like violating open container laws or possession of small amounts of marijuana. A member of Mark-Viverito’s team said that ideally people committing minor offenses would not be sent to jail at all, but that change is up to the state. City officials point to statistics showing that summonses and arrests for low-level offenses are less frequent than they have been in decades and that 2015 saw the lowest number of criminal summonses since 1997. They also say they as the Criminal Justice Reform Act is implemented they expect jail populations to further decline, given that police officers will be encouraged to issue civil summonses over criminal ones and defendants found guilty of some crimes will be allowed to complete community service rather than pay a fine. Both Ritchin and Goldberg stressed that they are unable to meet the overwhelming demand for their services and that they welcome the city’s bail fund. With the need so great, it may be a wonder to some why it has taken so long to get it up and running. Earlier this year, Mark-Viverito told Gotham Gazette that the bail fund as moving through the approval process at a slow pace because of state bureaucracy. The state only began licensing bail funds in 2012. Before then they were operating in a legal grey area. Ritchin and Goldberg say they understand why the city’s fund has taken so long to get licensed. From their experience the licensing process is protracted, frustrating, and perhaps not completely logical. Gotham Gazette has periodically checked in on the process involving the speaker’s office and state regulators. Those check-ins showed the name, The Liberty Fund; that it is being overseen by The Doe Fund, a nonprofit dedicated to helping homeless people; and that it was officially recognized as a charity by the Attorney General’s office in March. Since then there has been a bumpy back-and-forth application process with the state’s Department of Financial Services, which licenses charitable bail funds. DFS representatives have told Gotham Gazette that they waited at least a month for relevant information after requesting it from the applicants. Gotham Gazette was told on Tuesday by a DFS official that the process is likely to last a few more weeks. The city bail fund will be the first of its size in the state, available to people city-wide. Ritchin was involved in helping the Brooklyn fund secure its license while writing a guide for other funds to get licensed. He said the process was rocky despite his past experience and that bureaucracy in general would cause some delay, but, “It’s not just that it takes so long but that a lot of the requirements just shouldn’t exist,” Ritchin said. “Charitable funds face all the requirements of a for-profit business,” Ritchin said, noting that part of the process involves licensing bondsmen and making sure the fund will take absorbetent fees. Charitable funds naturally do not take fees and do not act as bondsmen. Bondsmen require clients put up a fraction of their bail and then promise the court they will cover the full bail should a client fail to make it to court. Charitable bail funds simply pay the bail. If a client doesn’t show the court keeps that money, just as if a client had paid bail themselves and then did not show up. Goldberg was a corporate attorney out of powerhouse firm Cleary Gottlieb when he began working with the Brooklyn bail fund. “I very much understand why it has taken them awhile,” Goldberg said of the City Council fund. “We had tremendous support forming our fund and yet it took us around two-and-a-half years before we could pay our first bail,” Goldberg explained. State Senator Gustavo Rivera, a Bronx Democrat, successfully advocated for licensing of bail funds after a judge ordered the Bronx Fund to stop issuing bail because he said it operated in a legal grey area. Rivera told Gotham Gazette earlier this year that he would love to revisit the law and that he has been working with the Department of Financial Services to streamline the process since it became law. Goldberg says he’s spoken to representatives of the Mayor’s Office and the DOE Fund about the bail fund and he welcomes it. “I am happy the city is taking on part of this problem,” said Goldberg, who acknowledged that even with the city fund fully operational there will still be more demand for bail services than all of the funds combined can handle. 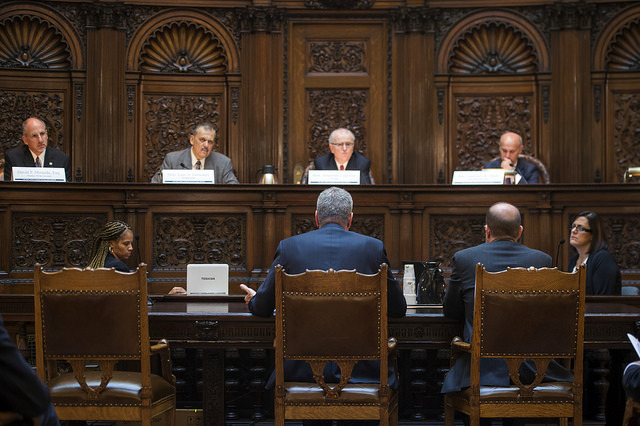 Tuesday’s discussion occurred just days after Jonathan Lippman, the very New York State chief judge Dewan referened, announced a series of initiatives aimed at addressing what he called the “unsafe and unfair bail system,” including an automatic review of all misdemeanor cases in which the defendant cannot pay bail within ten days of arraignment, and new training for judges to encourage them to use some of the other types of bail that are already available, rather than predominantly using cash bail for defendants. The purpose of bail is to ensure that defendants return for their court dates, but for various reasons, in New York bail has overwhelmingly become something that keeps poor people in jail as they await their trials. Panelists in Brooklyn discussed the human, economic, and criminal impacts of the way the system is being run. Kicking off the conversation, Dewan said, "The Supreme Court has said, ‘in our society liberty is the norm, and detention without trial is the carefully limited exception.’ It has become, unfortunately, in practice, the norm." Dewan pointed out that there are several different bail options available, such as allowing defendants to pay ten percent of the bail to the court up front and sign a paper promising to pay the rest later, or simply releasing defendants pending trial. One key issue criminal justice reform advocates have with the cash bail system is the fact that those who are held in pretrial detention tend to have worse outcomes to their cases. "They get longer sentences, they get less favorable plea deals, they’re more likely to plead guilty to crimes they didn’t commit," Dewan said, "and - perhaps most importantly - they are more likely to commit new crimes. So, we think we’re holding people in jail before trial to protect the public, but in fact we may be increasing the crime that’s out there." Judge George Grasso, a panel member, said now is the perfect time to evaluate "the issues impacting the fairness of our criminal justice system. I think Judge Jonathan Lippman really hit the heart of this bail issue this past Thursday, I think he used the term ‘Alice in Wonderland’ - referring to the fact that we have a system that metes out punishment first." "There are far too many people in jail who are really pretrial and who pose no threat to society," Judge Grasso continued. "Without waiting for state legislature to act, we can and we must make substantive changes to this system." To that end, New York City officials recently announced new measures to assist nonviolent offenders stuck in the city's bail vice. 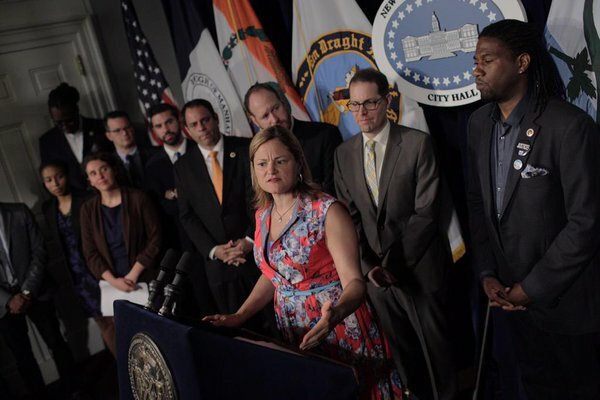 In late June, the City Council approved Speaker Melissa Mark-Viverito's proposal to set aside $1.4 million of the city's budget for a citywide bail fund to help pay bail for low-level defendants whose bail is set at $2,000 or less. Though some taxpayers may rebuke the idea of their money being used to bail people out of jail, Mark-Viverito argues that the bail fund would actually save the city money, given the fact that it costs the city a little over $450 a day per inmate to keep people locked up. According to Mark-Viverito, a defendant who cannot afford bail stays in jail for an average of 24 days for nonviolent offenses, like jumping a turnstile or marijuana possession. Similar initiatives, like the Bronx Freedom Fund and the Brooklyn Community Bail Fund, have had excellent results. Peter Goldberg, executive director of the Brooklyn Community Bail Fund, told the crowd gathered at the Brooklyn Historical Society, "In the past five months, the bail fund has paid for 133 clients, at a cost of about $110,000. Ninety-seven percent have made their court dates, even though they had no financial incentive to return. These are individuals who would have been jailed, perhaps for months, for the lack of a few hundred dollars. Out on bail, they’ve had significantly improved case dispositions. Fifty percent have had or will have dismissals. Not a single client has been sentenced to additional jail time. Clients who are out have not been coerced to plead guilty." In July, Mayor Bill de Blasio announced a separate $17.8 million initiative to reduce unnecessary jail time for those awaiting trial. The program aims to help roughly 3,000 low-risk defendants per year by substituting cash bail with a "supervised release" program, which would allow poor defendants to be released and supervised until their trial, rather than detained on Rikers Island. Judge Grasso, speaking of his own involvement in the development of city-wide initiatives to reform the broken bail system, said, "We are in the process right now of expanding supervised release for indigent defendants tried with misdemeanors and nonviolent felonies. They will use a risk assessment instrument and focus on linking defendants with appropriate services, and a contact regime in lieu of cash bail, to release people on their own recognizance. That’s what we’re working on expanding right now through Mayor de Blasio’s task force - I happen to be a co-chair of the subcommittee that recommended that." As Dewan pointed out during the question and answer portion of the discussion, typically, judges set bail for two reasons: “one, so that person will return to court; two, to protect public safety in the meantime.” Yet “in New York State, the law says you can only consider their likelihood of returning to court; you can’t consider public safety?” Dewan asked. Some criminal justice reform advocates want the city to entirely do away with money bail for low-level offenses, which officials in Washington D.C. did in the 1990s, opting instead for a system in which most defendants are either detained because they are considered a flight or safety risk, or let go without bail. However, in New York, such an overhaul would need to be approved by state lawmakers in Albany, where legislation to change the bail system has gone nowhere time and again. With 50,000 people - the population of Hoboken, New Jersey - locked up annually on Rikers awaiting trial solely because they cannot afford bail, the human cost of putting those “people in cages” can easily be forgotten. Panel member Miguel Padilla spent over a week at Rikers because he did not have the $1,000 he needed to buy his freedom. While driving his intoxicated brother-in-law home from a family gathering, Padilla was pulled over for a broken tail light, then arrested for driving with a suspended license. Desperate to see his wife and three children again, Padilla said he pleaded guilty “just so I could come home.” As a result of his brief stint in Rikers, Padilla lost both of his jobs and gained a criminal record, which in turn left him struggling to find a new job for over a year. "We should ask ourselves,” Judge Gasso said, “what is the primary purpose of our criminal justice system? Do we want a system that is based primarily on the concept of punishment, or primarily on the concept of justice?